MBBS in Kyrgyzstan is a key to open various doors of opportunity and achievement in the medical sector. An MBBS degree from the Kyrgyzstan opens a door to every country in the world. Kyrgyzstan is located in Asia and bordered by Uzbekistan, Tajikistan, Kazakhstan & China. It is also known by the name of Kyrgyz Republic. The capital of Kyrgyzstan is Bishkek. The country is used to be a part of USSR i.e. Soviet Union, but after the division of 1991 it became a separate country and since then it is known by the Kyrgyz Republic or more generally Kyrgyzstan. For the students from the varied countries MBBS in Kyrgyzstan is one of the best opportunity to fulfill their dream of MBBS Studies in Kyrgyzstan at an affordable tuition fee. Why not grab the golden opportunity of pursuing MBBS in Kyrgyzstan and realise your dream of studies in medicine. You do not need to worry because all the medical certificates are duly approved by MCI and other medical councils. The main languages spoken in Kyrgyzstan are Kyrgyz & Russian, though their national language is Kyrgyz. The country shares the route of the famous trade route known as “Silk Road”, which links China to the Mediterranean. The popular “Issyk-Kul Lake” is also found in Kyrgyzstan which serves as a tourist spot for a lot of tourists each year from around the world. The temperature goes below to -6 degrees during winters and is quite comfortable in summers not passing +30 degrees. Other than this Kyrgyzstan is also well known for its medical education. There are numerous medical universities and institutes well known for high standard medical education that they offered to the students. Numerous scholars from all across the world apply to various medical universities in Kyrgyzstan. Kyrgyzstan offers high-quality education with a safe atmosphere to the international students. The fee is very low as contrasted to many other European countries. The degree in medical obtained from the Kyrgyzstan is recognized globally. This helps the scholars to get a job in any part of the world. The medical calendar starts in June and ends in March. There are two semesters in each year, one from June to October and the other from November to March. The language in which medical education provided is English which makes it a favourable place for the scholars who came to get their degree from the overseas. The infrastructure of the medical universities in the Kyrgyzstan is much superior in terms of staff, equipment, and technology. The students are given hands-on practical clinical rounds and training which helps in their overall improvement as a doctor. The students from India are qualified to take MCI screening exam after they finish their medical degree from a medical university in the Kyrgyzstan. The MBBS or MD degree from a university in the Kyrgyzstan is approved by WHO and MCI. What type of a student visa you need to study MBBS in Kyrgyzstan? There are various types of visa that Kyrgyzstan embassy permits to the scholars to study MBBS in Kyrgyzstan, but the first step towards getting the permission is to apply for a student visa. This visa is issued for officially designated exchange professors, researchers, and students coming from big reputed international universities. If you are going to ask for this type of student visa to study MBBS in Kyrgyzstan, you will get a visa, which is valid until the end of the exchange program or scholarship agreement. This visa is issued by the Kyrgyzstan embassies abroad and it is not issued in the Kyrgyzstan. If you apply for this type of student visa to study MBBS in Kyrgyzstan, you will get a visa which needs to renew on every upcoming semester. 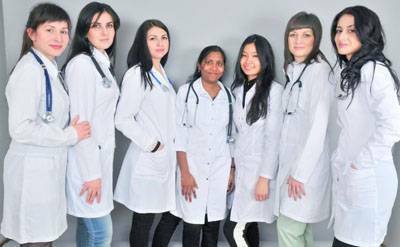 Necessary documents you need to study MBBS in Kyrgyzstan? High Skill and Qualified Staff. The degree is recognized worldwide. No IELTS, Bank Statement, and age limit. Recognized by: WHO, MCI, USA, FAIMER and Nepal. High quality in English medium. For the admission, you need to download the application form and fill it correctly. The school leaving certification and mark sheets of the 11th and 12th standard are needed. Scanned copy of a legitimate passport is compulsory. The documents need to be attested and approved. The admissions process is based on the first come first serve basis. The 10th and 12th mark sheets need to be approved by the Ministry of External Affairs, Government of India. Study MBBS in Kyrgyzstan from one of the renowned Medical Universities named OSH Medical University. This university came into existence as part of recognition that took place in the year 1992 when OSH State Institute became the OSH State University. The university is always pleased by providing education to the International Students to promote global education. The student comes in great number every year to get enrolled in Medical Course. OSH Medical Universityhas become a favourite choice for overseas students as well due to its increasing popularity. There are thousands of famous and renowned doctors now, who are the alumni of this university. It is also listed in WHO’s list of medical schools in the world. The quality of education is excellent and that is why many international students come to study medicine in Kyrgyzstan from here. If you are willing to have your medical education in Kyrgyzstan then this university can be your best option. When the government of Kyrgyzstan planned to commence an institute for training and development in medical sector to produce expert in the country, this university was founded (in the year 2003). As part of this process only, International School of Medicine was formed under International If students of Kyrgyzstan. This medical institute in Kyrgyzstan also registered with the World Health Organization, Foundation of advancement of International Medical Education and Research (FAIMER), Organization for Ph.D. education in Biomedicine and Health Science in the European System (ORPHEUS), and institute for International Medicine Education (IIME). Asian Medical Institute is established in the year 2004. It is located in the city of Kant which is 20 km away from the capital of Kyrgyzstan (Bishkek). The teaching pattern is a sort of combination of theoretical and practical knowledge helping the students becoming a proficient doctor. The faculty at Asian Medical Institute comprises of the faculty of general medicine, faculty of dentistry & faculty of nursing, faculty of preparatory course (Russian language). Stay in the Kyrgyzstan and enrol in masters, master of health service, master of public health or master of administration. Stayin Kyrgyzstan and work in the same country by clearing the licensure exam. You can go back to India and start working as a doctor by clearing the MCI screening test. You can migrate to Canada or Australia and start working as a practitioner by clearing the Canadian & Australia Medical Council licensing and State registration exam. Moreover, you can migrate to the USA and start working as a doctor by clearing the USMLE examination and ECFMG certification. In case you need detailed information and guide about the universities there are various online career council services available and they can help you by giving all the detailed information about the Medical universities and various courses they offer also can help you to get enrolled and keep you in touch with the universities.